This page is not intended as a complete treatise on the subject. It is not either intended to show what is considered good design practices. Good design practices require that any transmission line be terminated on its characteristic impedance at both ends. In these examples, the source side is intentionally not well matched. The point is to show that while it may cause other problems, from a signal integrity standpoint, it is sometimes sufficient to match one end of a transmission line. What is the difference between a regular wire or PWB trace and a transmission line? A connection is considered to be a transmission line when its length is greater than 1/10th of the wavelength of the highest frequency component that is to be transmitted. This is not a hard and fast rule, your needs may vary, but it is a useful rule of thumb. That means that if the phase of the highest frequency component cannot be considered the same at all points between the source and the load, you have a transmission line. For instance, if you carry a 100MHz square wave (with significant harmonics up to at least 1 GHz), any connection longer than about 1 inch will be a transmission line. On the other hand, a connection carrying a 100MHz sine wave (with negligible harmonic content) could be 10 times as long before being considered a transmission line. Please note that these lengths assume a velocity factor of 1. Most coax cables have velocity factors between 0.66 and 0.8, so the critical length will be reduced accordingly. This page shows a few oscilloscope pictures collected to show how impedance matching affects the waveform along a coaxial transmission line. These measurements are done using a technique known as Time Domain Reflectometry. TDR is based on the fact that when there are discontinuities in a transmission line, some of the incident power is reflected towards the source. The farther the discontinuity from the source, the longer it will take for the reflected energy to come back. This is used to determine, for instance, where an underground cable is damaged, so you don't have to dig the entire length to find the fault and make a repair. 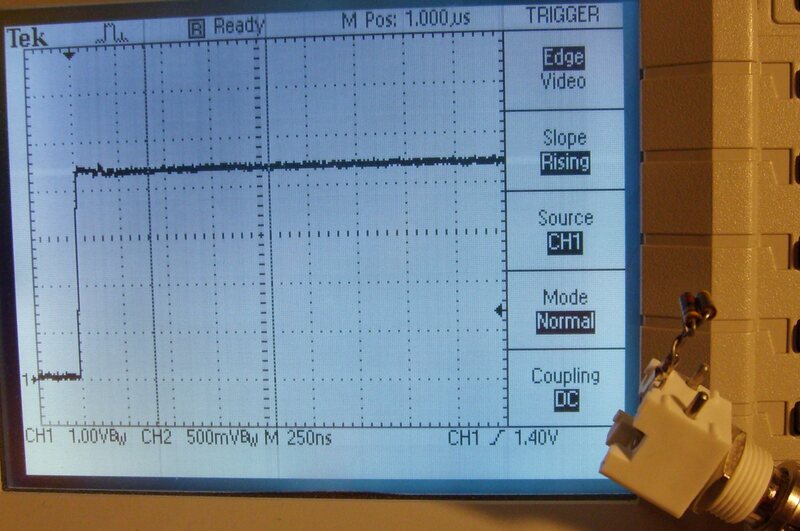 The basic setup consists of a fast rise/fall time pulse generator and an oscilloscope. Since my main purpose was to observe the reflections on a transmission line driving a ham radio antenna, I wanted to limit the energy of the radiated signal in order to reduce the potential for interference. I used the 1 Pulse Per Second output of my timing receiver which has about 10nS rise/fall times. 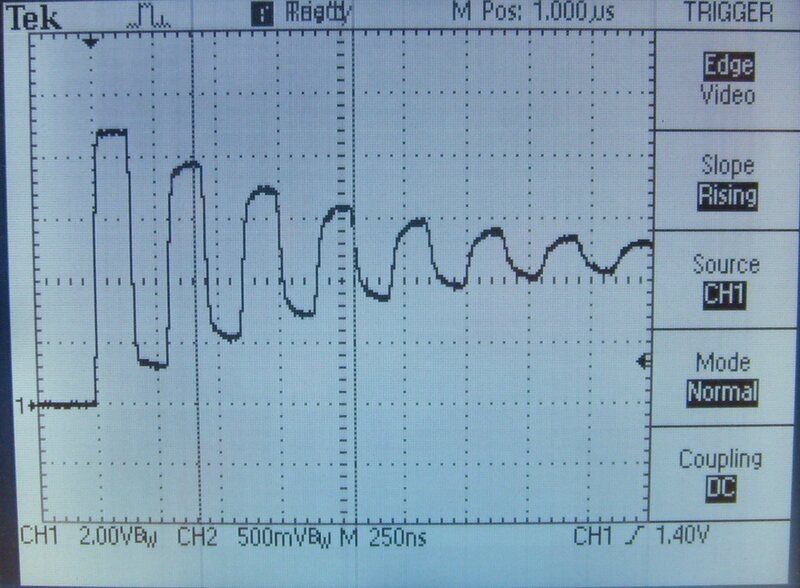 At this low repetition rate, I had to use a digital storage oscilloscope. A conventional oscilloscope would not have provided sufficient brightness. If you are testing a transmission line terminated by a conventional load or other, non-radiating circuit, you can use a higher repetition rate and a conventional oscilloscope. The repetition rate is limited by the length of the transmission line and its velocity factor. You can use any frequency between 10 kHz and 1 MHz that gives you good brightness on your oscilloscope. You need an oscilloscope with at least 60 MHz bandwidth to see pictures equivalent to those below. For the various measurements, we will display either the waveform at CH 1 or CH 2, and we will adjust the values of R1 and R2. 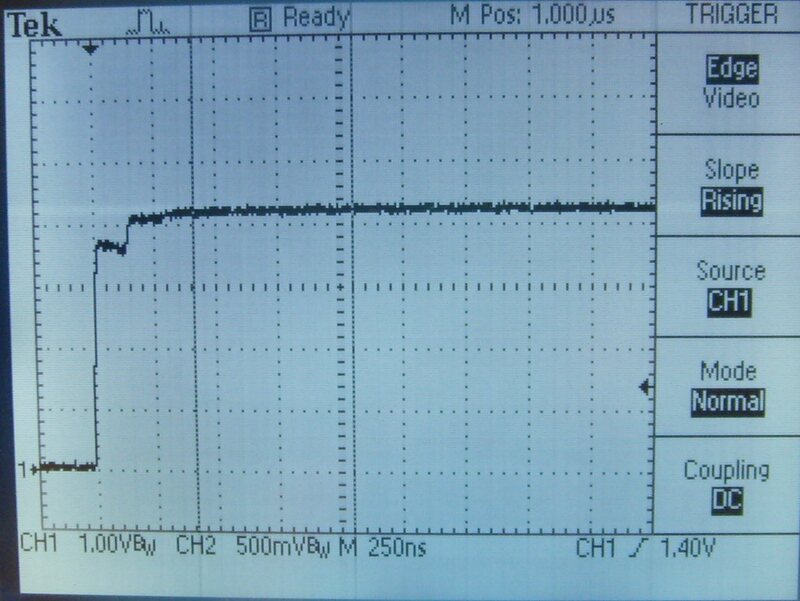 For the CH 1 connection, I used a BNC T so that the length of the connection between the junction of R1 and the cable under test (point A) and the input of the oscilloscope was very short. The scope is used with high input impedance (typically 1 Mohm in parallel with 20pF), and the cables are plugged directly into the scope. For all these pictures, R1 was set to a very low value (the timing receiver has very low output impedance.) I have planned to do some experiments later with a series resistance at the input of the cable (R1 > 0) to match the generator to the cable. I will update this page then. The PPS signal has about 5V peak amplitude into an open circuit and about the same into a 50 ohm load. These pictures were taken on CH 2, with R1 = 0 and a good quality 50 ohm coaxial cable about 4 feet in length, the type of cable you might use on the bench for general purpose RF work. (I will take pictures on CH 1 and post them later). Notice the high level of ringing. If this signal was to drive a logic gate, there might be problems. 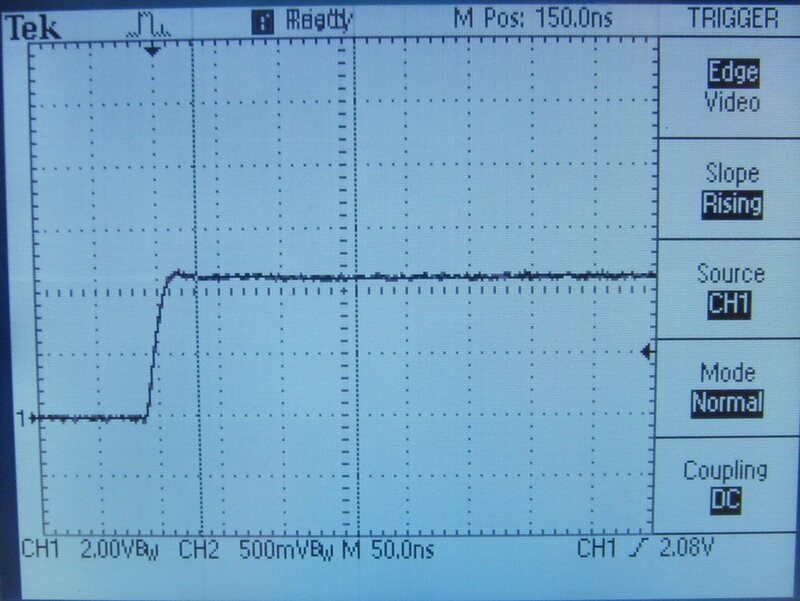 Here is the same cable with R2 = 50 ohm, still no resistance at the generator output (R1 = 0). Notice how clean the signal is now. Notice the high level ringing, and notice how square the ringing is at the beginning, then becomes closer to a sinewave before being completely attenuated. 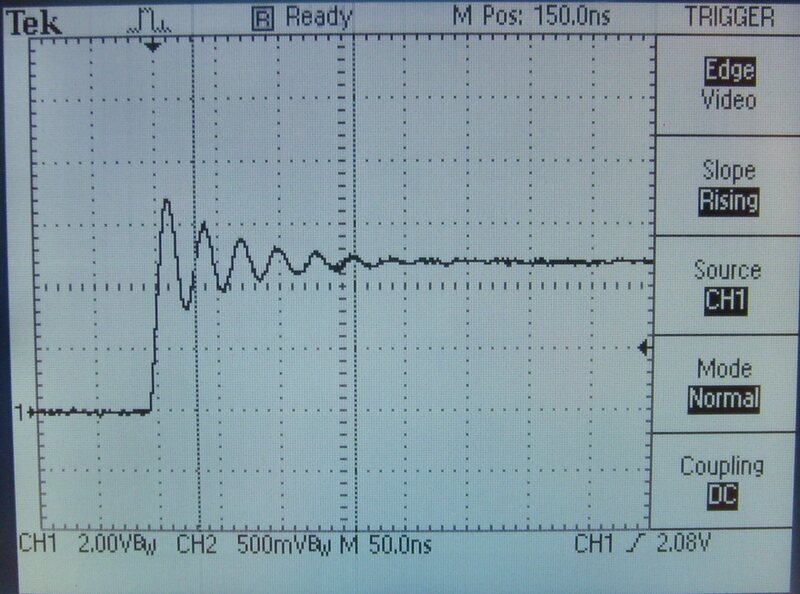 There is a clear step due to the small impedance mismatch (50 versus 75 ohms). In spite of this small step, the cable would be quite usable in a 50 ohm system. Notice the quasi perfect response, the ringing and step are gone. Impedance matching is important, even more so when the cable is long and the signals have fast rise time (or wide bandwidth). In most cases where signal integrity is important but power transfer is not (low power signals), it is sufficient to match the load impedance to the cable to eliminate ringing.